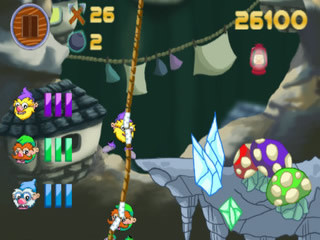 A chicken, and elf, and an old squirrel are descending into a crystal mine on a rope in this weird, bizarre, slow, and addicting game, Gold Miners. 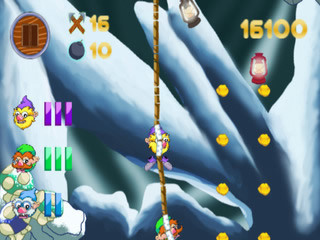 You have to collect gold that is suspended mid-air while trying to avoid sharp edges of cliffs full of minerals that would probably be way more valuable than the gold nuggets, if only you had a hammer and the rope didn’t keep lowering you down… imagine the horror of having slack in the rope? If you get three of them, then you can speed up for about a second (actually, probably less). This game is so slow that it hurts, so the lanterns are a good thing. You control the three beings on the rope. You can get them to swing one way or the other and if you hit a wall, then you get a life deducted. Each guy has three lives and once they’re expended, he falls off the rope. Once all three fall off the rope, the game is over. You can eat a turkey leg to get your lives back (for the ones that are still left on the rope, anyway). As you descend, the level background changes and different monsters show up. You can collect spears to throw at the monsters to collect points. There are also lamps that you can collect. Here’s some strategy advice: ignore the gold. Just swing there back and forth and if you’re about to collide with something, then interrupt the swing. If you swing the middle guy, then you’ll have the bottom guy going crazy, but to be fair, he goes crazy when you grab him, too. If you’ll touch the screen way below the rope, then you’ll have the most control. Alternatively, you can control the chicken at the top of the rope. Of course, if you want to make a fast turn, then the bottom guy is a good option, but be careful when he starts shaking and bumping into things.